The Opolette tunable laser series utilizes optical parametric oscillator (OPO) technology to generate wavelengths over a broad range in the NIR. Designed for portability, the entire laserhead fits into a 7×12” footprint and ships completely sealed to protect optical components from the environment. Requiring no installation, the system includes verification hardware to check alignment after shipping or relocation. All tunable beams exit the system from the same port resulting in one beam path to the end-user’s application. Wavelength tuning is motorized and computer controlled. WARRANTY: One year on pump laser, all optics and crystals, mechanics, and electronics. Includes all options except fibers. Includes two protective hard cases with custom foam padding. End-user installable/removable. Reduces max OPO by 10-15% when installed. Computer controlled. Can only be used with visible and near-infrared wavelengths. 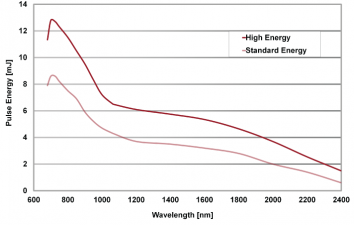 Can be optimized for either ultra-violet (UV), visible (VIS), or near-infrared (NIR) tuning ranges. Extends full system warranty for one additional year, for a total of two years. Includes all options except for fibers.